Impressive tool, the theatre mode offered some new ways to create machinimas. Linked to a powerful site like Bungie.net, it alows to take and upload high resolution picture very easily. Which is very useful to create galeries or posters for instance. As its name suggests it, Change of Scenery is a real change and thus deserves some fine posters. Whether it�s on discussion boards or websites, the first thing the audience is going to see online is the posters/screens of the video. Big deal then. I am personally convinced that a good poster can be enough to make someone check the movie, even more than an appealing synopsis. It�s a matter of information pace or laziness, you decide. This first poster is focusing on the main character of the grey hero torn apart between two armies. She is, indeed, stuck between two reds and a blue, who are looking at opposing directions. One can already see that she�s looking the same direction than the blue one: she�s still a blue. Thus the both sides are balanced with as many blue characters as reds. On that second poster, the smiley is supposed to attract the eye of the viewer. Thus it highlights the comic side of the machinima. 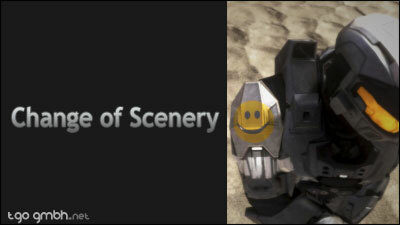 The smiley is aligned with the helmet (face) of the main character who, due to the high-angle shot, seems sad. You then have the two sides of the movie. Plus the hero seems to be pushed off the picture by the title, as she is pushed off her team by her boss. 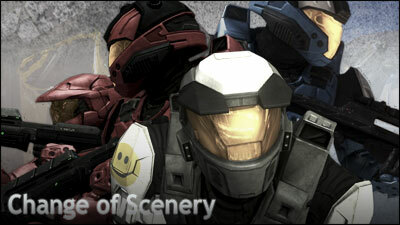 With these pictures we tried to respect our machinima and attract some viewers. Since it is original and its depiction of the ambiguous aspect of the movie, we like the second most. Did those posters made you feel like watching the movie?